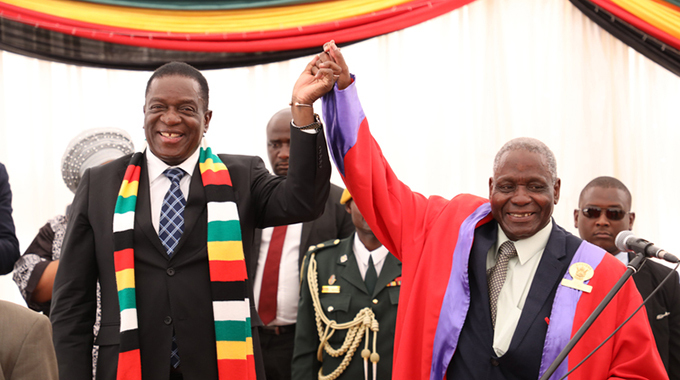 GOVERNMENT has allocated US$31 million to each of the country’s 10 provinces for the implementation of devolution as it accelerates efforts to revive the economy through empowerment of provincial economies, President Mnangagwa has said. In implementing devolution under the new dispensation, President Mnangagwa said traditional chiefs should claim their position and ensure development of their areas of jurisdiction. The President emphasised that his Government recognised the importance of the institution of traditional leadership as espoused in the country’s Constitution. President Mnangagwa made these remarks while officially opening the Annual Chiefs’ Conference in Kadoma yesterday where he also stressed the importance of peace and harmony to develop the economy. The meeting was the fourth engagement between President Mnangagwa and the chiefs this year. “I want to talk about the issue of devolution because each and every chief has his area of jurisdiction,” said President Mnangagwa. President Mnangagwa said traditional leaders are the custodians of the country’s cultural heritage and the land as well. He said he would soon discuss with his legal team to see if it was necessary for the traditional leaders to pay land tax for their farms. President Mnangagwa said Government was alive to the concerns of traditional leaders but some of the concerns could not be addressed overnight. He proposed that some of the challenges such as fuel and adjustment of allowances for the traditional leaders could be addressed through the money allocated towards devolution. President Mnangagwa said out the US$310 million allocated towards devolution in the Budget, each province would get US$31 million that could also benefit the traditional chiefs. He said traditional chiefs in Matabeleland South were left out when Government launched the livestock programme but going forward the chiefs would be prioritised. He apologised to the chiefs from Matabeleland South for the oversight. President Mnangagwa said Government was amending the Mines and Minerals Act to ensure that communities benefitted as well. “I agree with what your president (Chief Fortune Charumbira) said that it’s you who is always with the people and you should teach them a culture of hard work for us to prosper rather than to wait for a minister who can visit your area maybe just once or twice a year,” he said. President Mnangagwa said it was important for him to meet traditional leaders more often to share notes on developmental programmes. He said he was available any time to meet the traditional leaders and assured them that no one would die of hunger because Government had enough grain to feed the nation. To further guarantee food sustenance in rural areas, President Mnangagwa said the Zunde Ramambo programme should be developed and modernised to include irrigation and other developmental projects. President Mnangagwa was accompanied by his two deputies Dr Constantino Chiwenga and Cde Kembo Mohadi and several Cabinet ministers.